In order to qualify for the rebate, a non-compliant tank must be replaced with a new tank that meets Vermont’s AST Regulations. The work must be performed by a Vermont Certified Oilheat Technician and Inspector. Only one rebate per building, only one rebate per customer. The fuel oil tank must be installed after April 1, 2019 to be eligible. The Vermont Fuel Tank Rebate Program will close on October 31, 2019 or when funds are exhausted. All documentation must be received by October 31, 2019. 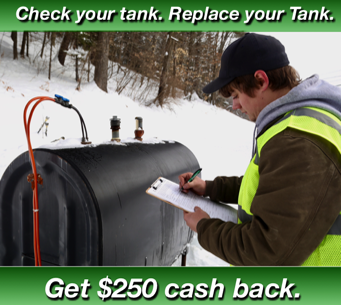 TERMS & CONDITIONS: The 2019 Vermont Fuel Tank Rebate is for an oilheat or kerosene tank installed at a home or business in Vermont. The tank must be installed between April 1, 2019 and October 31, 2019. The rebate check will be distributed directly to the customer only if the completed form, proof of purchase, and the New Installation/First Fill Inspection Checklist is received before October 31, 2019. The program will end on October 31, 2019 or when funds are exhausted, whichever comes first. Only one rebate per building. Only one rebate per customer. Recipients of a Tank Replacement Grant from the Vermont Dept. of Environmental Conservation are not eligible for the Vermont Fuel Tank Rebate. The Tank Rebate Program is subject to change without notice. INSTALLATION & INSPECTION: A tank qualifying for a rebate must be installed by a Vermont Certified Oilheat Technician and inspected by a Vermont Certified Tank Inspector. A list of individuals and companies that provide this service can be found at vermontfuel.com/list. The proof of purchase must include the tank size, manufacturer, purchase date, and vendor. LIMITATION OF LIABILITY: Performance of installed equipment is not guaranteed expressly or implicitly. No particular manufacturers, products, or system designs are endorsed through this program. PAYMENT: Allow 45 calendar days for delivery of payment. Incomplete or missing information will delay or deny rebate processing. All rebate requests must be received by October 31, 2019 or before the funds are exhausted (whichever comes first). Only one rebate per building. Only one rebate per customer.